As one of the most anticipated celebrity events of the year, the Star Magic Ball saw the gathering of ABS-CBN’s stars, distinguished guests, and friends from the world of show business. While many were excited to see the stunning gowns and the pairs who sashayed down the red carpet, we’re more thrilled to see how the Rizal Ballroom of the Makati Shangri-La was transformed into a glittering venue. An enchanting wall of foliage and whimsical lights defined the red carpet. The abundance of fresh greens and clusters of flowers gave the space an outdoorsy feel—completing the laid-back yet elegant vibe. Who wouldn’t fall in love with the all-white main red carpet floral wall? It’s sophisticated and romantic, a welcome break from the usual photo walls we see in other events. Robert has emphasized the use of fresh flowers for the event with the hashtag #AllFreshFlowers on his Instagram posts. RL Tip: Do you adore white blooms, too? Showcase them at home by placing your lovely picks in clear glass vases. Put one vase in the living area for an instant décor upgrade. Find elegant vases at Crate & Barrel. Inside the Rizal Ballroom, the setup was magical. The tables were dressed up in sleek black tablecloth to match the Louis Ghost-style chairs in the same color. Vintage candelabras and pretty floral arrangements completed the setting, too. 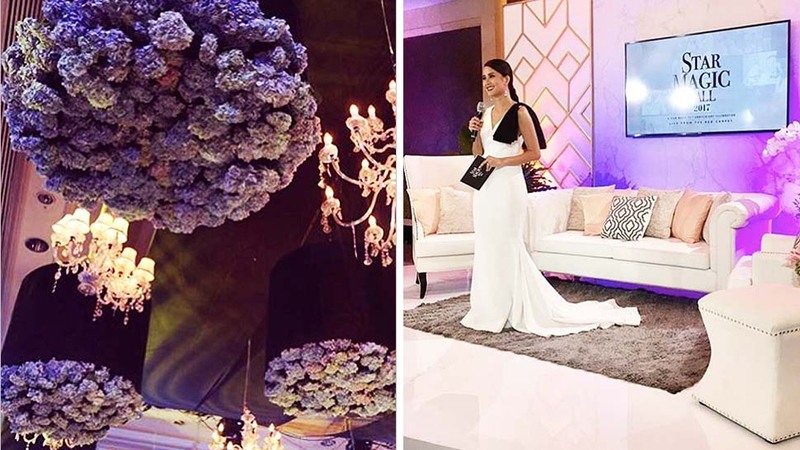 We're sure guests were also captivated by the beautiful pairing that spruced up the ceiling. Suspended from the ceiling were chandeliers that emit a warm glow and huge bouquets of fresh flowers—mostly Hydrangeas in shades of purple. These blooms are delightful to look at and will instantly remind you of a scene from a well-loved fairy tale. RL Tip: Planning to grow your own Hydrangeas? These flowering plants require deep watering at least once a week, or more, especially during summer. Since there are different types of Hydrangeas, keep in mind that there are specific ways to care for each. Feel free to ask for tips when shopping for your plants and blooms. We're sure that stepping into the Rizal Ballroom felt like going into the pages of a storybook. It served as the perfect setting for a special night of the stars. Aside from working on the main venue, Robert and his team once again worked with Vicki Belo and her daughter Cristalle as they converted a Presidential Suite into a Belo Clinic where stars can prep for the event and enjoy their favorite treatments. A bunch of flowers were used to liven up the space—some were also suspended from the ceiling and a few were showcased in beautiful vases to decorate the waiting area. According to Robert, the suite smelled great with the use of lavender flowers. The interview lounge designed and styled by Moss Manila also added glam to the Star Magic Ball. The space boasts a Hollywood-style look and feel with the use of wing chairs and Moss Manila Home’s signature, glamorous matte gold tables and ottoman stools. Upon closer inspection, you’ll see that the wing chairs and ottoman have nailhead trim. Pillows in beige and muted colors add a classic vibe to the seating pieces. To complete the vintage glam look of the interview lounge, Art Déco details and patterns can be seen on the wall, on the details of the furniture and even on the soft furnishings. Moss Manila Home is the lifestyle brand of Moss Manila Interior + Event Design House. The brand offers luxe pieces sourced from around the world and they also create furniture with contemporary flair. For more details, visit mossmanilahome.com or follow @mossmanilahome on Instagram. You can visit the store at #1 Granada Street, Gilmore, Quezon City.